My grandfather was a classically trained tailor. Apprenticeship and the whole nine yards. (Yards? Get it? I love a good play on words.) His specialty, of course, was men’s bespoke suiting. I like to think that I inherited my passion for fabrics and fixation on quality from him. Can I also blame credit him with my closet full of crisp shirts and somewhat obsessive love of stripes? I can still visualize his shop filled with bolts of the finest wools and threads of every color imaginable. It’s no surprise that, in fashion, I gravitate toward clothing with structure and, in interior design, I love clean-lined furniture. The overlap is obvious. That’s why I’m really enjoying the modern take on traditional tailoring that we are experiencing in fashion. You get the same structure, but it’s almost deconstructed in a super cool way. The look seems more casual and somewhat effortless … but that’s only possible because of the exceptionally thoughtful and skilled fabrication. Tailored accessories — from loafers to signet rings to box bags to metal-buckled belts — are the perfect finishing touch to menswear-inspired clothing. Remember the Tribute Goods bedding that I used in my bedroom for Traditional Home magazine’s Dallas showhouse? 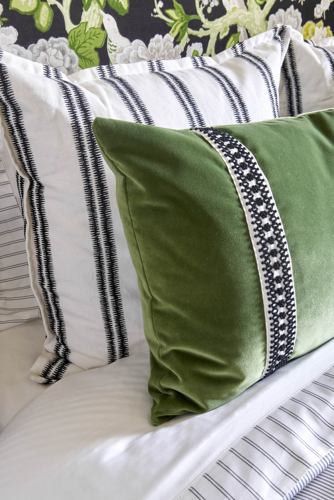 The exceptional style and quality of the Savile Row collection created a tailored backdrop, against which I added floral upholstery and repeated stripes in custom pillows to create a room that is both fresh and pretty. Feels like a feminine take on suiting, n’est-ce pas? In a way, I feel as though I’m following in my grandfather’s footsteps. 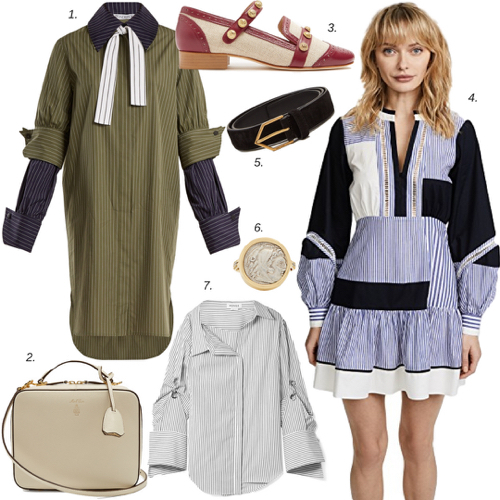 (1) JW Anderson Double-Cuffed Pinstriped Cotton Shirtdress, (2) Mark Cross Laura Saffiano Leather Shoulder Bag, (3) Rue St. Dean Street Canvas and Leather Loafers, (4) Tanya Taylor Menswear Stripe Yaya Dress, (5) Saint Laurent Triangle Buckle Skinny Leather Belt, (6) Dubini Ancient Diamond, Silver and Yellow Gold Ring, (7) Monse Oversized Embellished Striped Cotton-Poplin Shirt.